Sesame Noodles - Kosher In The Kitch! 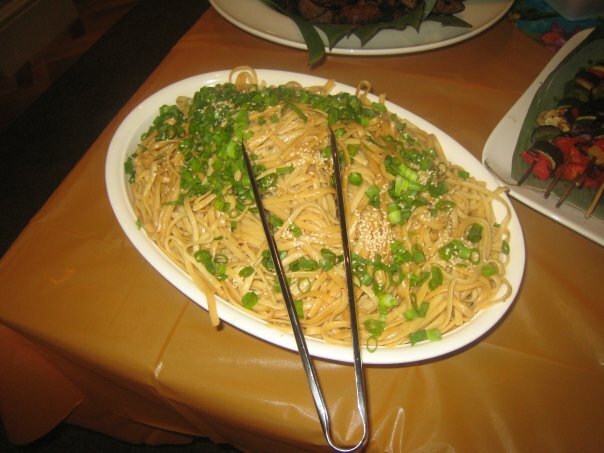 Sesame Noodles - Kosher In The Kitch! 2 tablespoons sesame oil – this you can’t replace! Cook linguine, drain and transfer to large bowl. In a saucepan, combine garlic, sugar, oil, vingar, soy sauce, sesame oil and chilli/red peeper flakes over medium heat. Bring mixture to a boil stirring constantly until sugar dissolves. Pour over linguine, tossing to coat. Sprinkle with scallions and sesame seeds.